At Hamilton Physio & Rehab, our Physiotherapists are trained to recommend and fit the proper custom knee brace for your specific injury or post-operative needs. Our therapists will use specialized instruments to take precise measurements of your leg to ensure the best fit possible. Custom Knee Braces are made specifically for you. Your leg is measured through precise instruments and a brace made of a composite of materials will be used to form your custom brace allowing it to be supportive, lightweight and most importantly, functional in your daily activities. 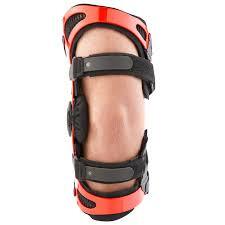 The custom knee braces are suitable based on your assessment and your need. Generally, knee ligament injuries (ACL, PCL, MCL, LCL), meniscus tears, instabilities and osteoarthritis of knee can immensely benefit from a custom knee brace. We are also a provider of DONJOY/ BREG knee braces which are made of various light weight composite materials, are comfortable to wear, and provide support and functionality with everyday activities or sports-specific needs. At Hamilton Physio & Rehab, all our Physiotherapists have received training to recommend and fit custom knee braces for your specific condition. We are able to measure and tailor braces for the same.